From the first release of a castle in 1970 to the monolithic castle sets of today, Lego has been satisfying the medieval building enthusiast with choices in every price point, theme, and scope. Sets have come a long way since the yellow bricked castle of old. With the addition of mini figures and cool secret rooms, you can find a Castle Building set that will either start your collection or add to your ever-growing compilation. Whether you love Harry Potter, Architecture Lego, or the magic of Disney, we’ve got the best castle list to round out your collection. There is a castle set for everyone’s interests from the little tot getting their first Lego set, to the serious curator who needs the biggest and best money can buy. This mega structure is not for the faint of heart. With over 4000 pieces, it’s one of the biggest castles to date. Including highly detailed rooms filled with inspiration from some of the greatest Disney movies of all time. It comes with 5 mini figures which are a little low for something of this size and it is missing a few of the most important like Cinderella. I suppose the glass slipper in the hidden room is close enough. Not all castles have to be owned by the good guy. This dark fortress has a piece count of 932 and comes with a whopping 9 mini figures. Including 3 separate sections and four stories filled with bad guy relics and treasures, this castle is perfect for the intermediate builder. Metallic color features and a horse mount catapult add to the sinister dark palette of the set. A cauldron of fire adds to the overall villainous feel of the fortress. If you are looking for a great piece from the Lego Knights Kingdom collection, this one is my top pick. This castle has been revamped a few times and the result is pretty awesome. With a spiral staircase and detachable towers and classrooms, this stronghold has it all. Although only two of the four teams are represented in the Great Hall, you’ll find plenty of secret compartments for hours of Lego play. The castle folds together for a great detailed look at the outside appearance of Hogwarts. With 11 mini figures, though, you think that Ron Weasley would have been included. Poor Ron looses out again! This 376 piece Lego castle set is the perfect smaller set to start a collection. With 5 mini figures and extras like gold coins and a gold brick, Dragons Mountain is a sure-fire choice for the beginner castle enthusiast. The large-scale dragon has an updated fire piece that is sure to delight the younger builder. With a secret potion room, a tower with a dungeon and a usable catapult, the Dragons Mountain set is the perfect addition to enjoy hours of fun. Did I mention it comes with a fire breathing dragon? Enough said! For the fanatic of all things Medieval, Kings Castle is the best set Lego has released. This epic set has the perfect design elements for a right proper castle. With a functioning catapult and drawbridge, as well as a collapsing back wall, Kings Castle brings legends of Camelot to life. The movable staircase and hidden escape door add to the overall design of this coveted Lego set. 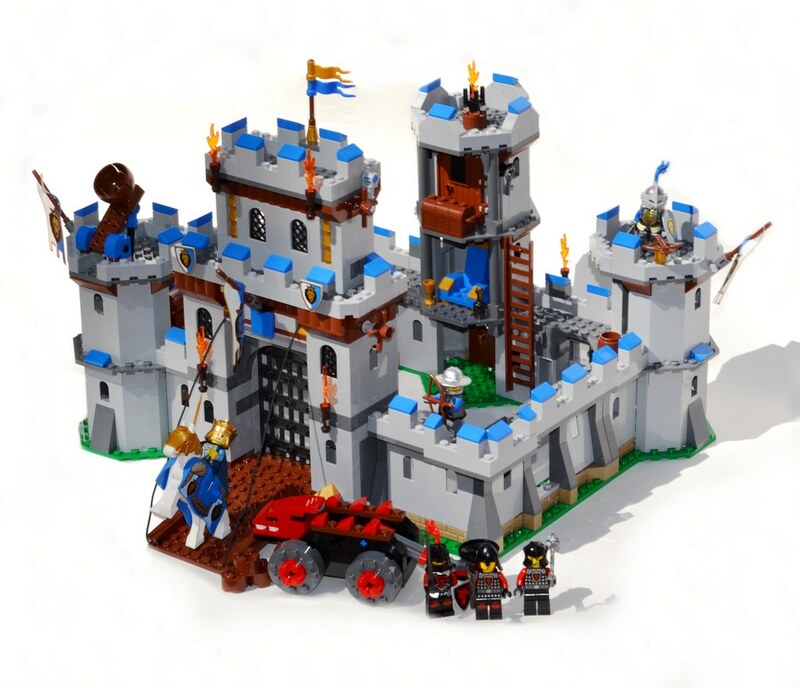 With just under 1000 pieces and 7 mini figures, the Kings Castle has everything you need to re-enact battles of centuries past. It’s an enjoyable build and is the first reconfigured castle from Lego since the late 80’s -early 90’s. A must have if it doesn’t already hold a place in your collection. View all of the best rated LEGO here. Why are these 5 the piece de resistance of Lego Castle Sets? You maybe asking out of the many castle inspired sets that Lego has created, why these five need to make their way into your collection. Who can argue that having castles that are synonymous with some of the biggest pop culture icons of all time would complete any Lego aficionado’s collection? Not I! Everyone knows that the Disney Castle is a universal symbol, whether you love Cinderella or not. That dragons are the best mythological creature ever because they can take down an entire army in one fiery breath. Who wouldn’t want to go to Hogwarts Castle? It is a school we all dream of attending. These 5 building sets from Lego have all the great additions of any remarkable castle. If you are looking for Lego sets that are from an array of collections that will endure time, these 5 sets are your best picks. Each one has something truly special to create and you will bask in the overall design once you’ve finished assembling them. They are all available to date and you can start adding each of these 5 remarkable castle sets one by one. Medieval castles have always had a certain fascination with young and old. The legends, the kings and the mighty creatures of lore have been showcased on the silver screen and in great works of literature for decades. Lego has encapsulated the legends of yesteryear in some of the best designed sets to date. If you’ve ever wanted to be a wizard casting a spell, a knight that saves the entrapped princess from the evil queen, or the owner of your own personal fighting dragon, Lego has you covered. From moving pieces to secret treasure stashes, golden caches to super cool weapons, each of these castle collections will bring hours of enjoyment. There is a range of price points for every budget and different sizes as well to match a gamut of skill levels. With so many Lego castle sets to choose from, take my advice and add these 5 onto your must have list!